Last weekend I attended the CD Baby DIY Conference at the Omni Hotel in Nashville, Tennessee. After a busy morning of workshops on Friday, I hit the taqueria tucked inside the hotel for lunch. I wasn’t super hungry, so I made a meal of just one Baja fish taco with a side of Mexican street corn. Oh, MY! It was all so delicious I was wishing I had ordered doubles! The Baja fish taco was a tangy, delightful combination of fried Pacific cod, slaw, chiptle mayo, habanero salsa, sour cream and queso fresco served on a handmade tortilla. 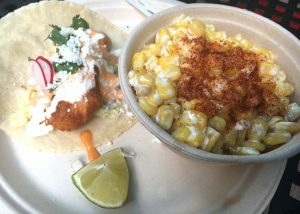 The Mexican street corn was the perfect complement, creamy and spicy.